Set off from U-Bahn station Senefelderplatz – one of the lively spots in Prenzlauer Berg. From here, explore the old tenement blocks and backyards. Now continue in a westerly direction along Fehrbelliner Straße to Zionskirchplatz with its eponymous church. There are numerous cafés on the square, such as Kapelle, where you could stop for a capuccino. 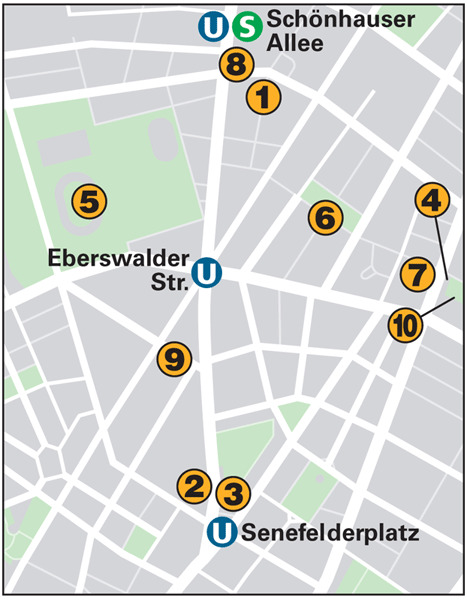 Continue along Zionskirchstraße, then turn left into Kastanienallee. This is one of the most colourful streets in the quarter. At the end of the street you could pop into Prater ; now turn right into Oderberger Straße, one of the best preserved streets of the district. Continue along Sredzkistraße in an easterly direction until you reach Husemannstraße. 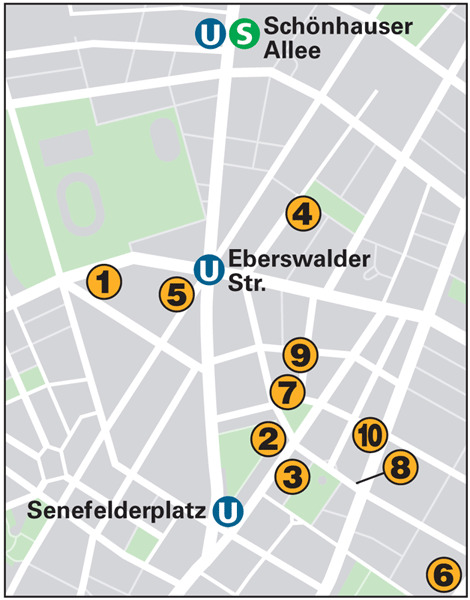 Have a good look around the Old Berlin streets, you may find something interesting to buy. You could have lunch at one of the many restaurants in Kollwitzplatz : Gugelhof and Zander are both worth recommending. Continue along Knaackstraße to the small Synagoge Rykestraße. From here it is only a few paces to the Wasserturm in Knaackstraße. Give your feet a rest on the small green space around the tower, before continuing along Belforter and Kollwitzstraße to Schönhauser Allee. You will find perfect tranquillity there in the Jewish Cemetery. Not the most beautiful street of Old Berlin, but one of the best preserved. This alternative cultural centre hosts concerts, performance art events and festivals. The wedge-shaped square is dedicated to Alois Senefelder, a pioneer of modern printing techniques. At its centre is “Café Achteck”. A trip to outer space – see stars, planets and galaxies under the silvery dome of the Planetarium. The vast sporting terrain near the former border, comprising Max Schmeling Hall and Jahn Sports Park, was built for the Berlin Olympics in 2000. Today it hosts sports and music events, and a Sunday flea market. All around this square, time seems to have stopped in 1925. The residential buildings are reminiscent of a social housing programme. The small lively museum documents the history of the district and its poor working-class inhabitants in the 19th century. This legendary Currywurstimbiss was opened in 1930 under the U-Bahn steel viaduct. The spicy sausages are among the best in the city. This tree-lined street has remained almost completely unchanged. The old municipal swimming baths of Prenzlauer Berg are also located in this road, at No. 84. One of few parks in the northeast of the city, dominated by Socialist prefabricated buildings. It has a giant monument to Ernst Thälmann, a communist who was murdered by the Nazis. This quaint little Kietz (neighbourhood) pub serves up basic Berlin and German dishes in an alternative, relaxed setting. Bill Clinton was once a guest at this restaurant, which attracts clients from all over Berlin. The menu features an original combination of German and French dishes. A small restaurant, offering imaginative new interpretations of local fish specialities. The three-course set menu is one of the best in the district. An amicable, rustic wine bar with a great selection of Austrian and German wines and solid bistro fare. Surprises at Prater include a beer garden, a rustic restaurant in the courtyard, and free live concerts. Almost legendary club, playing rock and indie to an alternative crowd. This venerable restaurant still pulls in the crowds with its deliciously light German cuisine. Go Russian at this Moscow-style venue, with borshch, Russian music and vodka. Popular restaurant and bar on the Prenzlauer Berg hill. One of the best and friendliest Thai restaurants in town, the Mao Thai serves traditional and artistically presented Southeast Asian food. All restaurants accept credit cards and offer vegetarian dishes unless stated otherwise.